The storms of December 2015 not only damaged or destroyed many homes and businesses in Kurnell, but also had a devastating impact on the natural environment of the Kurnell Peninsula. For the second year running, Benedict partnered with not-for-profit environmental organisation, Greenfleet to replant the damaged nature zone. Green Fleet organises support from corporate volunteers to help restore and preserve the natural environment in the area. 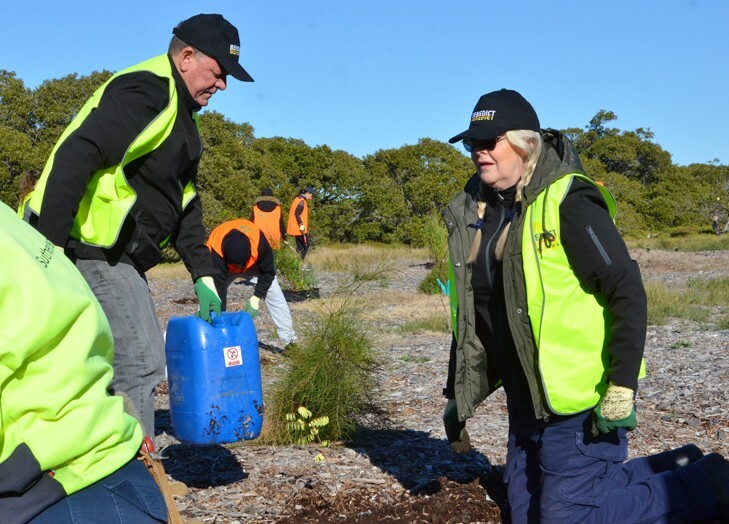 “At the most recent planting day – attended by 30 volunteers, a total of 1,300 native seedlings and saplings were planted in Bonna Point Reserve by Benedict the other Greenfleet volunteers” said Sutherland Shire Mayor, Carmelo Pesce. “Huge piles of mulch generated during the clean-up process have also been lying in wait at Bonna Point Reserve and they were prepared for planting by the volunteers. Aside from Benedict volunteers, organisations including Smartsalary, Telstra, Airbnb, Kumho Tyres Australia, Scarab Rouge and SEA LIFE Trust ANZ sent volunteers to help in generous corporate social responsibility initiatives. “What a fantastic opportunity to swap the office to work in the beautiful outdoors of the Shire,” said the Mayor. “Being out and about also provided the volunteers with insight into the work of both Sutherland Shire Bushcare and Greenfleet through its carbon offset donations made to compensate where energy efficiencies are not possible. “With around 3,000 hectares of natural areas in the Shire, community involvement is essential to help restore and preserve natural areas of Sutherland Shire. All of the volunteers have done an excellent job today” said the Mayor.